How do you compare an epic shot in Africa with a hard-edged character study about a piano teacher and her pupil? 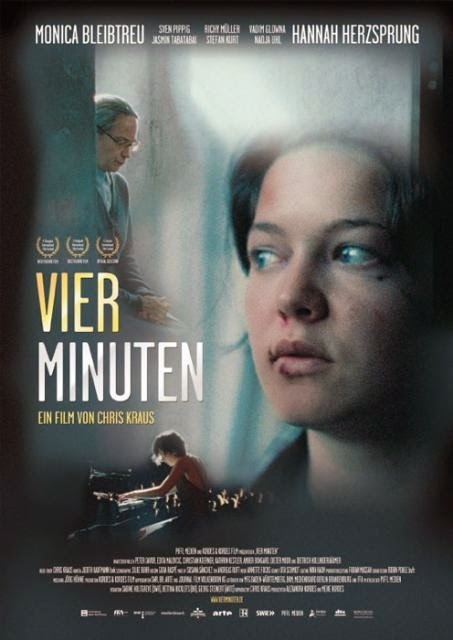 The truth is, Nowhere in Africa (2001) and Four Minutes (2005) are two very different films in terms of time frame, point of view, and even tone, however both of these pieces of contemporary German cinema take a look back at the nation’s heritage in one way or another. Ultimately, both movies are fine representations of German film, because it is often very difficult to push forward culturally unless you fully acknowledge what has occurred in the past. In the case of Nowhere in Africa it is a Jewish family moving to Kenya before the outbreak of World War II. Then in contrast, the other film takes place in the present, but relates to the past through flashbacks. Both prove to work well within the context of the film and the tone which is trying to be conveyed. Thus, these differences were good because they mean there was an individuality that was created by the directors and teams behind each respective film. The Oscar-Winning Nowhere in Africa, directed by Caroline Link is a semi-biographical film based on the recollections of Stefanie Zweig who was transposed to Kenya as a young girl with her parents in the 1930s. This makes the film not just a historical drama, since it is specifically following the recollections of someone looking back on a period in their life. Although we can assume that the protagonist is indeed remembering her childhood, the story does take place entirely in the past. As an audience we see the contrast between the harsh and prejudiced Nazi society and the peaceful beauty that seems to radiate out of Africa. They are two very different landscapes that truly shaped Regina’s adolescent years. The cinematography used to depict Nazi Germany for instance develops a dark mood through the depiction of the frosty snow-covered streets. The assumption is that this is a country that is cold towards Jews and although Regina is not old enough to know it yet her life in Africa will be much more welcoming. When the Regina and her mother arrive where her father is, their little home is situated on the sunny savannah. This is a stark difference from the harsh winters of their native land. Perhaps more noticeable than the change of climate, is the change in people and with that the mood changes as well. The African natives are depicted as generally kind, playful, and welcoming. Jettel, who has preconceived notions of other individuals, is initially guarded and callous towards the natives, because she is used to a hierarchal and racialized society. Little Regina on the other hand has a genuine openness at her young age and she embraces the people including the faithful cook Owuor. As he sensibly notes near the beginning and as they part ways, “You are wise. You must show [others] the way” (Nowhere to Africa). Paradoxically, despite the advanced age and experience of her father and mother, it is Regina who truly understands this life. She is not bogged down by racial and ethnic barriers. The first time she actually recognizes what anti-Semitism is occurs when the Jews get singled out during the recitation of the Lord’s Prayer at the school (Nowhere in Africa). It is these types of experiences back in Europe which have undoubtedly hindered her parents’ immersion into the African culture. Her mother for one is barely able to integrate into this humble lifestyle until the very end of the story. Even though Regina’s father has embraced the land of Africa, he still has very much to learn about the culture. Together the two of them struggle through a marriage that is plagued by emotional highs and lows which creates turmoil between them. Their daughter is truly the one with the “eyes and heart” like the Africans and she is the one in harmony with this new world, because the Nazis are just a distant dream to her (Nowhere in Africa). In other words, the parents and their daughter simply have different ways of viewing the world and it in turn influences how they allow history to affect them. The angst-filled Four Minutes directed by Chris Kraus is a very different creature than its contemporary Nowhere in Africa and it is a film that looks at German heritage through a different lens entirely. The most obvious deviation is that Four Minutes is not a recollection of former memories, it is a film in the here and now. Sometimes it becomes painfully clear that we are not in Kansas anymore, or rather the 1930s Africa of the previous film. There is obviously no longer a need to flee from Fascism, but as we already know there are other problems to deal with. Prisons are hell holes, sexual abuse is a prevalent issue, and the specter of the past still hangs over some. This last instance is the situation for an elderly piano teacher named Ms. Kruger, because she was once a nurse during the Nazi regime and her past forever haunts her. She takes on the delinquent Jenny as her pupil and they have a rocky relationship to say the least. Although Jenny is much younger, she has a personal history all her own with a father who abused her and a baby who died inside of her (Four Minutes). For both of them their past experiences have shaped who they are and as a result both have become isolated social outcasts, and in many ways they were made for each other. Ms. Kruger’s past comes back through flashbacks and mundane conversations. These memories seep through in bits and pieces of her playing the organ at a hospital, perhaps spending time with her lover, maybe getting interrogated by the SS, or walking through the rubble only to find her lover dead. At first these images are very disorienting because we are not given any voiceovers as cues. However, this strategy seems to work well in this film since it suggests that these memories can come unexpectedly when she is alone and even in fits of sleep. It even comes out when Mrs. Kruger talks to people like the prison warden who she likens to her “first warden,” the “SS-Sturmbannfuhrer” during the war (Four Minutes). This is a quite outrageous and unfair comparison, but her mind always reverts back to the earlier times. In this way Jenny is good for Traude causing her to face reality. In one scene a hurt Ms. Kruger discloses her story to Jenny and then cries out, “Why do you think I’ve stayed here for 60 years.” Jenny’s answer is near perfect. Instead of showing sympathy, in her typical insensitive style she replies, “You’re a perverted freak, madam” (Four Minutes). This is so callous to be sure and yet the relationship they form causes not only Ms. Kruger but also Jenny to leave the past behind them. They share their love for music and allow it to shine through all the pain that has occurred in their lives, even if it is only for four minutes. That was enough. They proved that out of the ashes and out of the hurt beauty can still rise.